schedule this weekend. 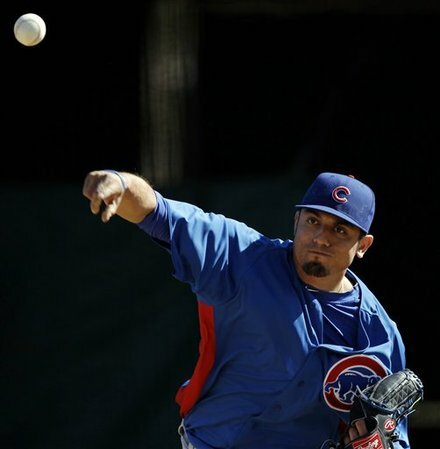 Rodrigo Lopez will get things started, he will be followed by Ryan Dempster, and Matt Garza. Dale Sveum was quick to caution fans trying to read too much into Dempster being ahead of Garza, saying that they will determine the rotation to start the season sometime in the middle of spring training. Lopez gets the first crack to prove he belongs at the back end of the Cubs rotation. Other competitors for the four/five spots in the rotation per Sveum are Randy Wells, Travis Wood, and Chris Volstad. It looks more and more like it will be something along the lines of Garza, Dempster and Maholm to head the rotation, but anything can and usually does happen in the Spring. Yes Cubs fans, you read that correctly, and it’s not up for discussion according to Cubs skipper Dale Sveum, “It’s Bryan LaHair’s job, and it’s not his to lose. It’s his job and the guy has earned the right to have it and he’s earned the right for me to have a lot of patience too if he’s not getting off to a good start.” As Dale Sveum begins to dive into his first camp as the Cubs manager, he is starting to piece together what the opening day lineup will look like. Much to the surprise of many, the first decision that was made was that of Brian LaHair not only starting at first base, but hitting 4th, arguably the spot in the lineup for a teams biggest run producer. Cubs fans got a taste of LaHair at the end of last season, and one could say that LaHair’s performance was one of the few bright spots in a very dark season. In 59 at bats last season LaHair hit a respectable, if not solid .288 with a .377 on base percentage. That type of on base percentage was unheard of for a Cubs player last year given the complete lack of discipline and patience at the plate from the team as a whole, in fact LaHair’s OBP led the team, not counting Steve Clevenger who only had 4 at bats. Another sign that spring training is right around the corner, aside from the 50 degree temperatures in Chicago today, is that the Cubs have announced the twenty one non roster players that will be invited to spring training. Headlining that list is 23 year old outfield prospect Brett Jackson. While none of these players will necessarily break camp with the Cubs (nine have previous MLB experience) they will all have the same opportunity to do so during spring training. It will be interesting to see how the Cubs new staff on, and off the field evaluates the organization’s time in Arizona.